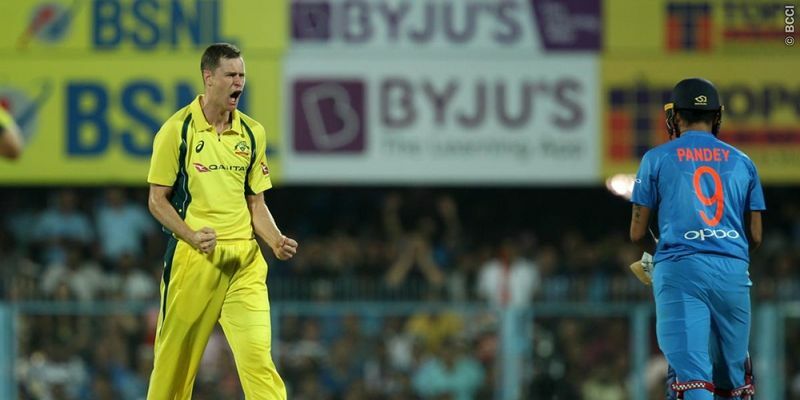 Jason Behrendorff, the latest Mumbai Indians debutant, is looking to secure a spot in the upcoming World Cup in England and Wales on the back of an impressive performance in the IPL. The pacer also said that it was a great experience playing in front of the huge crowd in Mumbai and winning the game. The 28-year-old pacer had made his first international appearance in a T20I match way back in 2017 but he has just made his ODI debut in the recent series against India Down Under and has been impressive with the new ball since then. The pacer played four out of five games against India but could only play two out of the five matches in the series against Pakistan. But he is hopeful that along with another left-arm pacer Mitchell Starc, he can make a cut into the 15-man Australian squad for the quadrennial event especially if he puts up a good performance in the Indian Premier League. "It can happen. It is not foreign to have two left-handers in the team. Australia have not done it a lot in the past but I don't see why we can't do that. Mitch bowls exceptionally well at the death, can also bowl at the middle and upfront. So, it might be a case if both of us are picked in the same team, we can do different roles. I might bowl upfront and Mitch may look to bowl through the middle and at the end. It would be quite exciting," Behrendorff said, at a press conference, reported PTI. The New South Wales bowler made a promising start in the IPL in the match against Chennai Super Kings on Wednesday. He bowled a wildly swinging ball and dismissed the opener Ambati Rayudu for a duck. He followed it up with number three Suresh Raina’s wicket in the sixth over. Behrendorff also shared the strategy behind Raina’s dismissal and did not fail to give credit to all-rounder Kieron Pollard for his one-handed blinder. "It was a serious catch, wasn't it! (I was) very fortunate, to be fair. We set the plan for that knowing that he loves to back away and hit over the off side. Our plan was there and personally I was a little bit wider than I would have liked but Polly (Pollard) took the great catch, which was fantastic,” he explained. Mumbai Indians were sluggish with the bat for the most part of their innings. They were at a score of 125 at the end of 18 overs but a brilliant knock from Hardik Pandya and Pollard at the end, involving five sixes and a four, took their total to 170. "It (victory) is huge. Hardik and Polly just pulled us on the front foot going into the bowling innings. 170 was really a good score after we were potentially a little bit slow at the start. And then you had to take some wickets in the first couple of overs and really put them on the back foot and do not let them off from there," Behrendorff expressed. The fast bowler was snapped up for Rs.1.5 crores by Mumbai Indians in the auctions last year. But he did not play any game because of an injury. He finally made his IPL debut on Wednesday and was overwhelmed with the experience of playing in the cash-rich league. "It is a great experience, really exciting. It was a good fun, good crowd out there as well. So a great experience, and to contribute to the win was awesome. I was not able to come last year. So I was really excited to come (this time). There is such a buzz about the IPL every time you watch it, every time you hear about it," he said. The MI recruit plays for Perth Scorchers in the Big Bash League and pointed out the difference between the two of the biggest leagues in world cricket. "It is different, both are extremely good competitions. This (IPL), of course, has a few more stars in the competition with four international players, rather than two, per team. It is different conditions as well, quite warm and humid -- something I am not quite used to, so making sure the hands are dry,” he signed off.